The DVD is in NTSC format. Kentro is a registered trademark of Angelika Thusius. Angelika Thusius is thrilled to announce the release of her new 2014 Kentro 2-disc DVD; KENTRO® Body Balance, Movements for a Healthy Back and Body! Disc A provides a thorough and lively Introduction to Kentro, as well as a section on How to Practice, and Combining Movements. Disc B offers a complete and clear visual presentation of 33 Kentro Centering Movements, organized into Sitting, Lying Down and Upright Movements. This DVD package also includes a four-page Educational Insert, completing your independent Kentro practice. 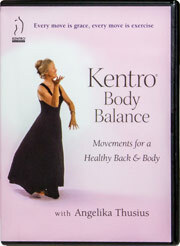 This DVD complements the 33 Movements in the book "Kentro Body Balance, The Secret Pleasures of Posture."